Top biblical scholars and historians have created this readable, substantive text introducing students to the current and relevant issues related to the study of ancient Israel. Value is placed on the Bible's historical contribution without overlooking critical issues and challenges in understanding Israel's history. 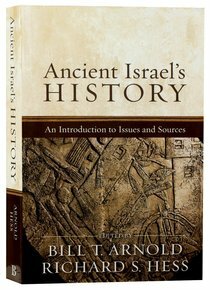 About "Ancient Israel's History: An Introduction to Issues and Sources"
:The history of Israel is a much-debated topic in Old Testament studies. On one side are minimalists who find little of historical value in the Hebrew Bible. On the other side are those who assume the biblical text is a precise historical record. Many serious students of the Bible find themselves between these two positions and would benefit from a careful exploration of issues in Israelite history. Bill T. Arnold (Ph.D., Hebrew Union College) is Professor of Old Testament and Semitic Languages, William Edmond Conger, Jr. Professor of Academic Leadership, and Director of Hebrew Studies at Asbury Theological Seminary. He has written or edited numerous books books, including 1-2 Samuel (New International Version Application Commentary), Encountering the Old Testament; Encountering Genesis; A Guide to Biblical Hebrew Syntax, Genesis (New Cambridge Bible Commentary) and the Book of Deuteronomy (replacement volume- New International Commentary of the Old Testament). Dr. Richard S. Hess (Ph.D., Hebrew Union College) is professor of Old Testament and Semitic languages at Denver Seminary. He has held National Endowment for the Humanities, Fulbright, and Tyndale House (Cambridge) postdoctoral fellowships and grants. Dr. Hess has done translation and revision work for the New International Version, New American Bible, Holman Standard Christian Bible, and English Standard Version translations of the Old Testament. He is an editor of a series of commentaries on the Septuagint and has translated books of the Septuagint for Logos Bible Software. He has written commentaries on Joshua (Tyndale Old Testament Commentary)The Song of Songs (Baker Commentary on the Old Testament Wisdom and Psalms), Leviticus (Expositor's Bible Commentary revised), Job (Historical Commentary on the Old Testament), and 1 & 2 Kings (New International Commentary on the Old Testament), along with texts on Archaeology and the Old Testament, Hebrew Grammar, and the study of ancient Near Eastern texts related to the Old Testament.